You and your spouse have been enjoying life with your lovable pup, and now it is time to make an addition to your household. A child is a special gift, and with them, great changes in life will come to pass. This doesn’t mean that your canine companion has to go anywhere though. Life will change for them too, but you can make it a positive experience for them with some preparations. When you first get the good news, it is time to begin adjusting your pup for the future. The house will need to be set up with new territories. 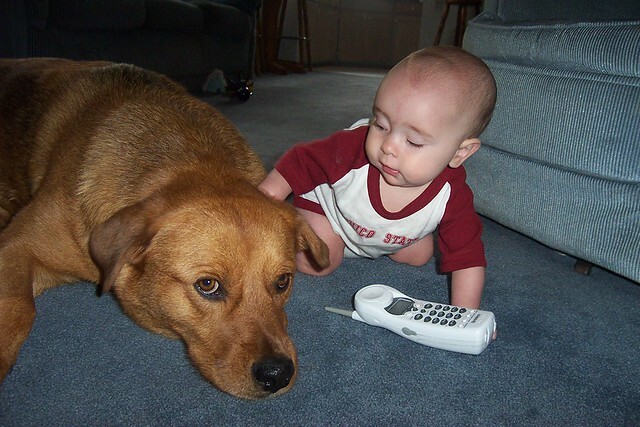 A baby and your pup should not be alone together where the baby will be sleeping or playing. Gate the doors off so that your pup will begin to adjust to not having access to these rooms when your baby does arrive. During meal times, consider barring rooms that will be used for feeding to build a habitual schedule for your pup. It will be a good idea to create a safe zone for your pup with either a cage or a room to themselves. Toys, food and water should be available to them here, and consider leaving them in there during certain times of the day to help them adjust. Don’t make the room or cage a “bad” place for them, interact with them still and make sure they are entertained. Slowly adjusting them to the change is best for your pup and will keep them from being “startled” by the radical change of a newcomer. Begin introducing baby equipment as early as possible. Items like strollers, swings and cribs will change a pup’s environment. This is especially important for older dogs that have some difficulty seeing. The new furniture and environment will slowly adjust the pup to the new changes. You should also consider finding or downloading “baby sounds.” Play the sounds throughout the day to get your pup used to the sounds a baby is going to make. Playing with your pup while this is going on will positively reinforce familiarity with these sounds. One of your pup’s other great senses is “smell.” Begin using baby lotions and powders on yourself so that your pup will become familiar with you and the way the baby is going to smell. While introducing your pup to all these changes, remember to set special times aside for them each day so that they will know that you are not forgetting them. Once the baby arrives, it may be a good idea to let your pup stay with a friend for the first few days while you get settled in. When your pup returns, though it may be difficult, make sure that you still spend time with them. This keeps your pup’s anxiety levels down so that they will not become aggressive towards the new changes. It is strongly recommended that your pup and baby not be left alone together for at least the first few months. This will give you time to understand how your pup is going to react to the newcomer. As your baby does become older and learns to crawl around, keep in mind that your pup can get hurt from your babies curiosity. Pulling and tugging can startle or hurt a pup and result in retaliation. So it may be best to always keep an eye on both of your “kids” at all times. Preparations for your newcomer will help your four-legged friend adapt to the new situation. Sudden changes can startle your dog and may cause anxiety as they fear the changes and possible feelings of neglect. Slowly adapting them to the change will help relieve the stress, but to make it positive for them, they will need love and affection during the process. Next Next post: What Is A Pawdicure?